Buy this item and earn 10,709 ClubPoints. 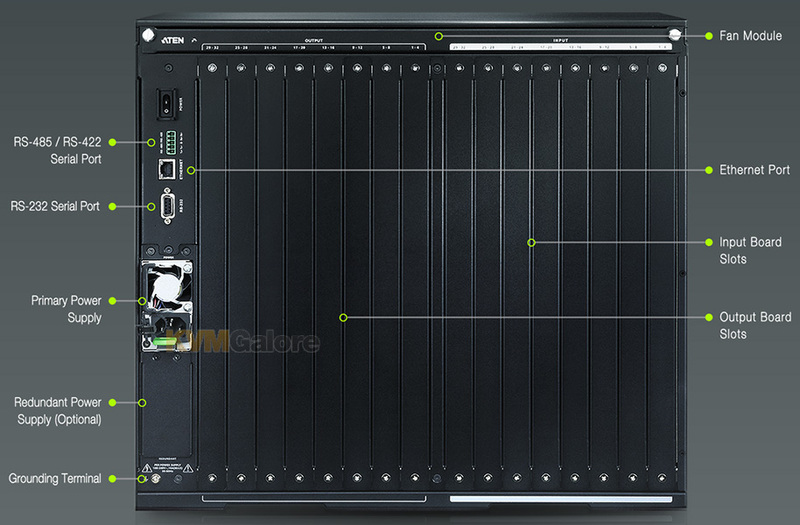 VM3200 modular digital matrix switch offers advanced access and real-time control of multiple local and remote A/V input devices and displays from a single chassis. VM3200 allows users to independently switch and route video and/or audio content directly to various monitors, displays, projectors and/or speakers simply by pressing front panel push-buttons. 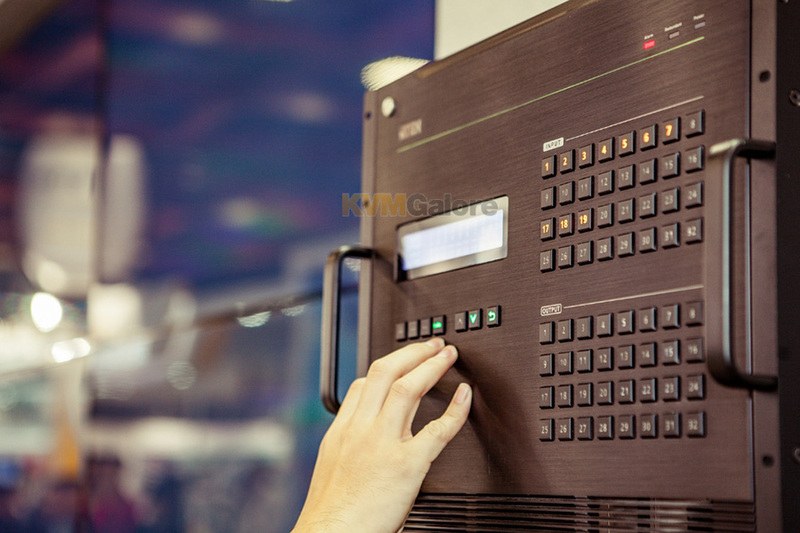 A built-in scaler encodes the video format in order to provide seamless, real-time switching. 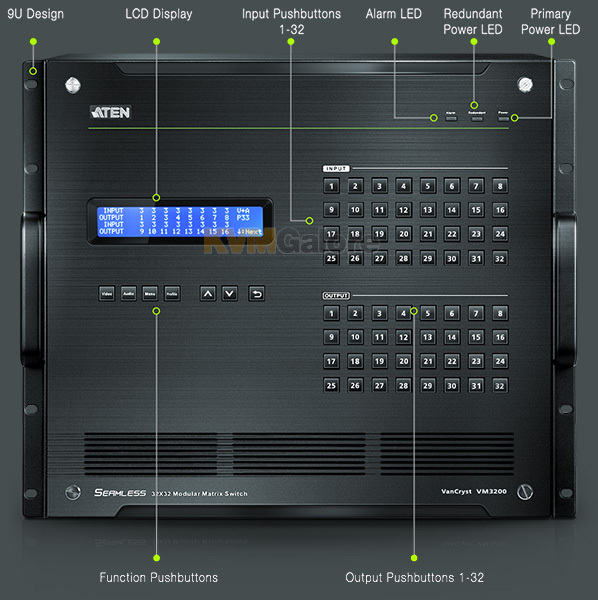 Operators can work from 4x4 up to 32 x 32 inputs and outputs simultaneously, as well as incorporate multiple digital video formats within the setup. It uses TMDS technology to support high speed data transfer at 1080p / 1920x1200 @ 60Hz / 4Kx2K @ 30Hz (4:4:4). The front panel LCD shows a quick view of active port connections, with an option to select an EDID mode that yields the best resolution across different monitors. VM3200 is easily expandable and accommodates a lineup of hot-swappable ATEN I/O boards. Equipped with automatic signal conversion, it allows any combination of digital video formats, such as DVI (VM7604/VM8604) and HDMI (VM7804/VM8804), thus making it ideal for large-scale A/V applications such as broadcasting stations, traffic and transportation-related control rooms, emergency service centers and any application that requires customizable high speed A/V signal routing. Combining these devices, this solution can be conveniently customized, allowing users to independently switch and route video and/or audio signals to various monitors, displays, projectors and/or speakers simply by pressing front panel pushbuttons. VM3200's built-in scaler encodes video formats in order to provide seamless, real-time switching while ensuring stable signal transmission. In addition, the front panel LCD shows a quick view of active port connections, and includes an option to select an EDID Mode that yields the best resolution across different monitors. 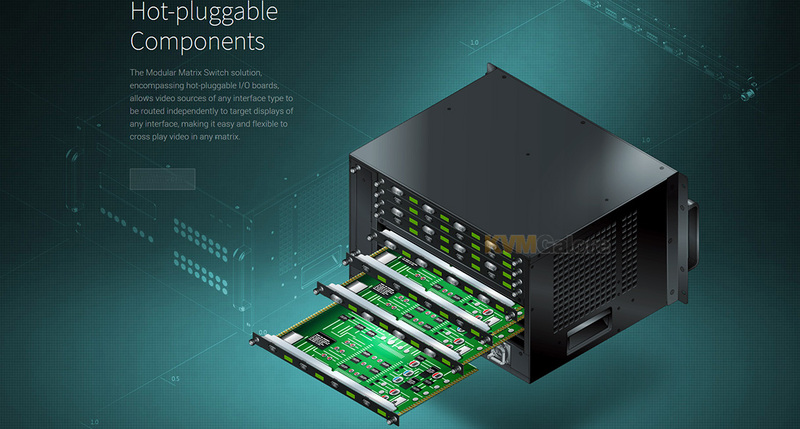 VM3200 is easily expandable and accommodates ATEN's hot-swappable I/O boards. Equipped with automatic signal conversion, it allows a combination of digital video formats, thus making it ideal for large-scale A/V applications. Setup is fast and easy; install the modular I/O boards by sliding them into VM3200's rear panel slots, then plug the device cables into the appropriate ports on the I/O boards and your ready. This solution can be connected to the network through VM3200's LAN port, allowing the installation to take advantage of internal CAT-5 Ethernet wiring built into most modern commercial buildings. Once initial network setup has been accomplished at the local level, VM3200 can be conveniently managed remotely using any web browser. Furthermore, for complete systems integration, VM3200's built-in RS-232 and RS-485/RS-422 ports allows the switch to be configured through a high-end controller or PC. 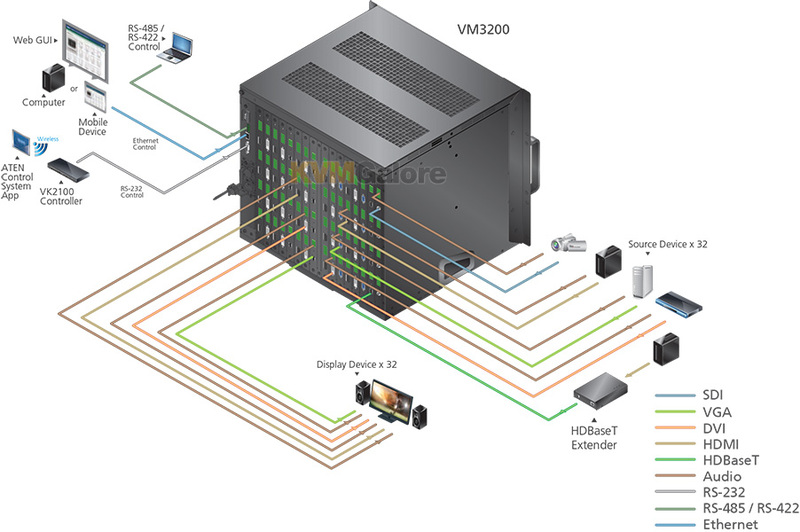 VM3200 offers real-time control and advanced access to manage up to 32 video sources and 32 displays simultaneously, through modular I/O boards in a single chassis. 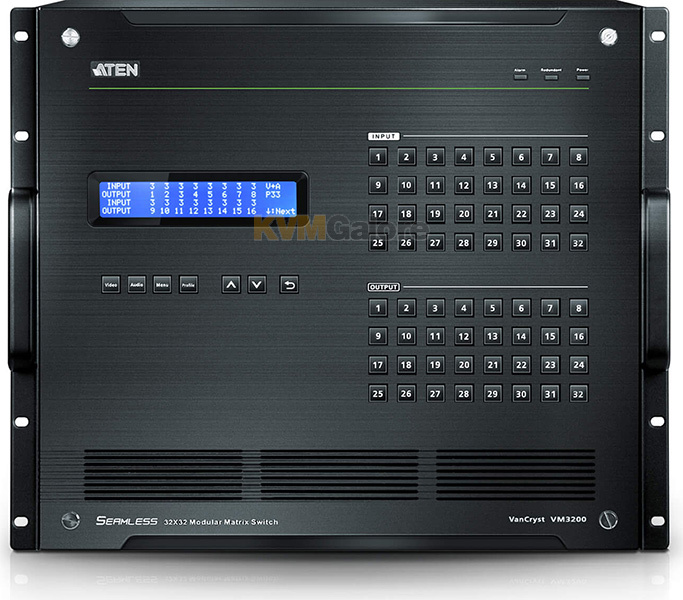 Empowered by ATEN Seamless Switch™ technology, the matrix switch, incorporating a speed-progressive video switching function and a unique scaler, integrates seamlessly with video wall systems - to project live video with precision in any dimension on a perfect timeline. 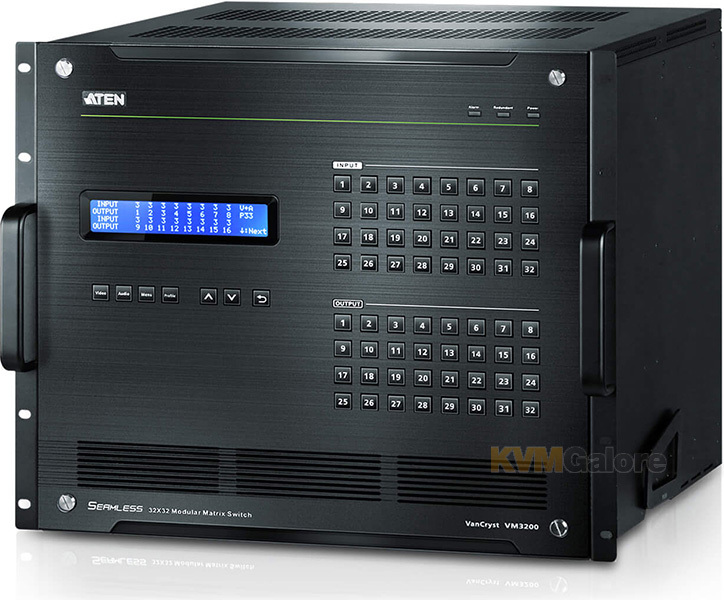 ATEN VM3200 is a powerful integrated A/V setup targeted towards broadcasting stations, traffic and transportation-related control rooms, emergency service centers and any application that requires customizable high speed A/V signal routing. 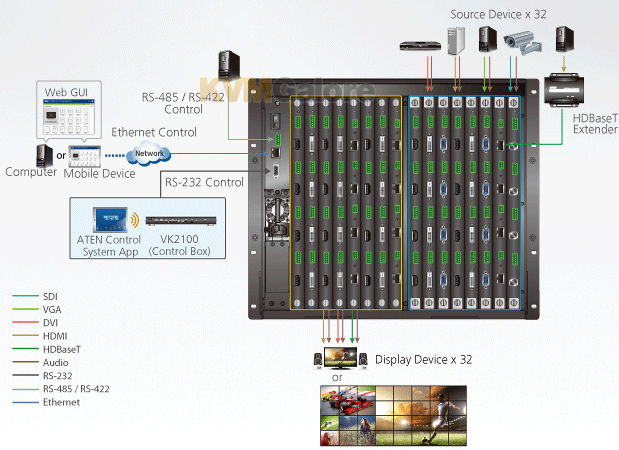 Built into VM3200 is a high-powered video wall processor. With a state-of-the-art processor, VM3200 easily manages multiple wall configurations such as a 4x4 or 3x3 plus a 2x2, or four 2x2's. 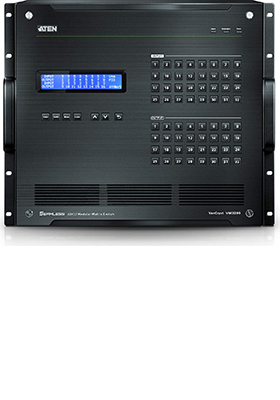 With a simple GUI interface for the user to customize the audio/video wall outputs, VM3200 provides high flexibility for multiple applications from one box. 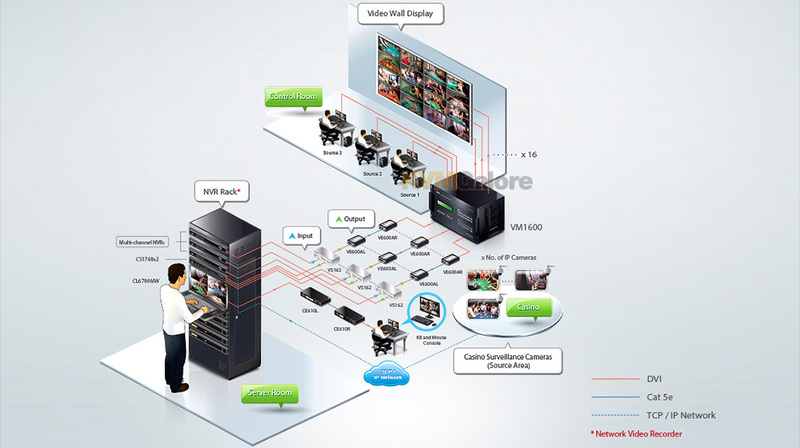 A unique scaler utilizing ATEN FPGA technology is built in VM3200 to unify various video input signals and render optimum output resolutions on displays with uncompromised precision. Through an intuitive web GUI, up to 32 video wall profiles can be created with custom screen layouts, viable in a wide range of pro-A/V applications. 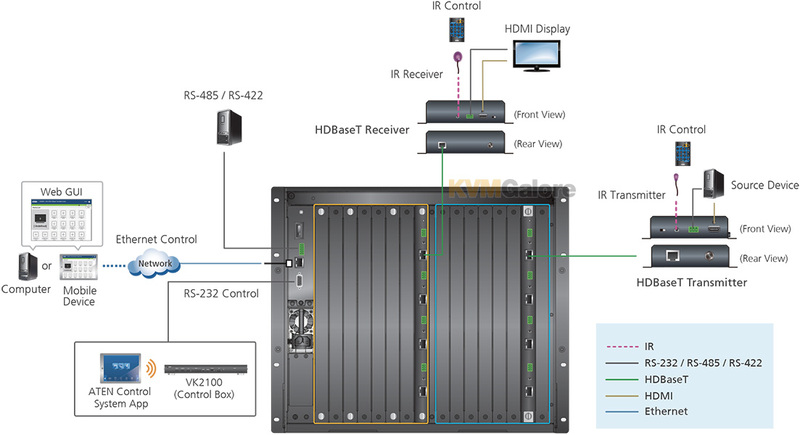 VM3200 features an all-in-one control mechanism that integrates video wall processing and matrix switching capability in a single chassis. This new approach not only simplifies installation with streamlined management, but contributes to overall system reliability. VM3200 is equipped with a spare slot for a redundant power module, in case of an unexpected power outage. This prevents single points of failure from experiencing system downtime, keeping the system highly available at all times without interrupting any existing services. * Note: If Seamless Switch is enabled, the video output will not display 3D, Deep Color or interlace (i.e., 1080i) resolution features. To availl of these features, you must disable Seamless Switch. 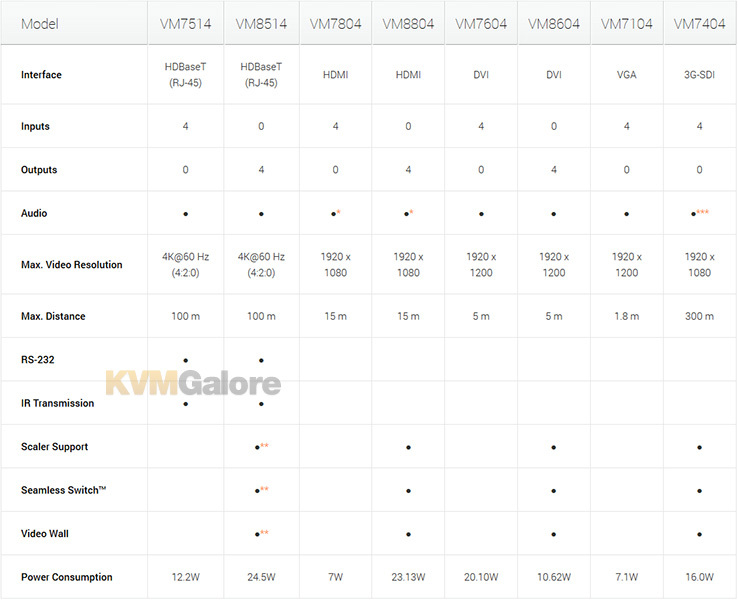 Listed below are additional products to consider which are compatible with VM3200. These items may be required to complete your system.